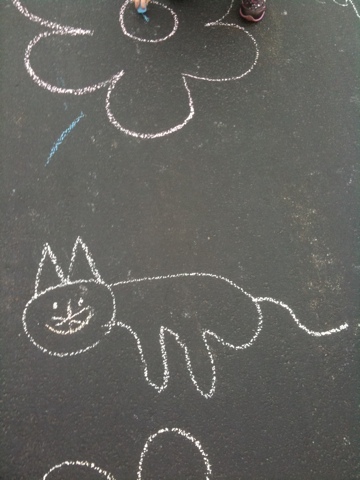 I picked Cardin up from my mom’s house after work and arrived to a plethora of chalk drawings in the driveway. You can easily determine the chalkings that belonged to Cardin. They are all identical; blue lines. No matter what you draw for her she comes along and draws blue lines on it. The remainder of the drawings are always an interesting collection of artifacts drawn by, none other than Picasso herself. Listen lady, let’s put it this way. When we play the family board game pictionary, my mom is like the kid who gets picked last for kickball. Her artistic talents are a little on the short bus side. She’s really awesome at stick figures though. Today I got the pleasure of enjoying this cat. Note how it only has two legs. She claimed the cat was sitting on it’s rump, therefore you can only see the front legs. You will also see that this cat looks like it was punched in the face and suffers from a Michael Jackson nose syndrome. I’m surprised my mom takes credit for these masterpieces. I’d totally blame my lack of artistic ability on my kid. What else are kids good for if you can’t blame them for your farts and bad drawings?